I'm sorry (kind of) for the blast of family photos that is about to happen. In addition to my maternal grandpa being sick, My father's mother is likely not going to make it through the end of the week and I've been going through old photos to take with me when I fly home. I've gotten lucky in a lot of respects. But one place that will always hold the greatest amount of joy is flipping through old family photos. Both of my grandfathers hold a strong interest in taking photos. This means that a lot of my life has been captured on film, which is something I don't regret. 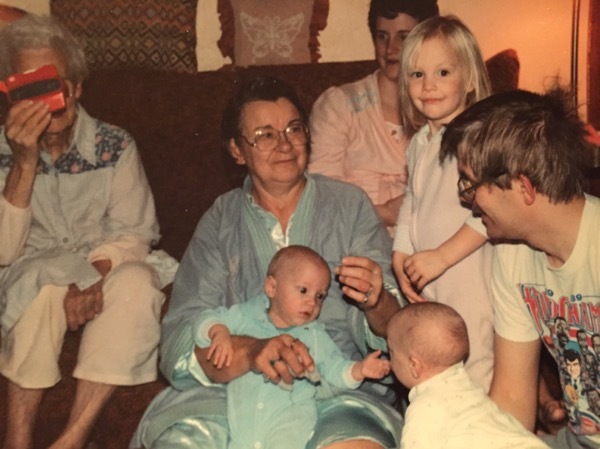 Our family has some really hard but precious times captured to memory through photos. It's much easier to celebrate the joys in life when you have strong memories and evidence of them. So behold, some of my favorite photos. Likely, you'll see more than just these in the coming week but I thought that I'd share a few now. This photo was taken towards the end of 1990, my brothers' birth year. They were born prematurely and had respiratory problems as a result. Obviously, they've pulled through but not with ease. But you'd never guess that looking at this photo. When I was born, I had 5 living great grandmothers. One of them, far left, clearly maintained a sense of humor despite Alzheimer's. No one in the picture caught her goofing off, but my grandpa behind the camera did. My brother looking as if he's philosophizing about something while unable to speak. And then there's my grandma. My grandma's engagement talking to my dad out of frame. She's still the focal point of the photo despite everything else going on. Being right smack in the middle of everything. She does that. What's not pictured here is the 4 generations of women in this room. Two great grandmothers, one mother, one aunt, one grandmother and a youngest, only daughter and granddaughter. What is pictured is the look of joy on my mother's face. She was about 28-29 when this photo was taken. I'd imagine on her 50th birthday (which is in 6 days) We can crack the same smile out of her. Inserting this here because, really, how cute is this freaking jack-o-lantern grin? My brothers can be absolute shitheads but sometimes they are freaking adorable. This is a perfect example of this. This is my grandma. Putting my hair in rollers and me cheesing while wearing (of course) my favorite Aladdin night gown. Pictured in back (per most photographs between the ages of 1-10) is my beloved Mickey Mouse. I don't think there's much of a story here outside of the fact that I probably wanted my hair curled because grandma did her own, and more than likely, those curls fell flat about 20 minutes later.